Defending champion David Powell survived a seven game duel against the classic stroke making of Mathew Ball. Men’s top seed David Powell (AUS) saw off a surprisingly strong performance from New Zealand’s Mathew Ball, winning their semi-final encounter in seven games. Ball went in to the match using a passive game. Unafraid to block, he put the pressure on Powell to take risks. At times the Kiwi would make a forehand played down the line in a similar vein to William Henzell’s trademark counter. The tactic was working and the defensive play led Powell to try get some serious muscle behind the ball when the deciding game got underway. The extra spin paid off. But in a time of need the experienced Australian went back to the old faithful of backhand to backhand rallies and took five consecutive points. The final score, 11-7 in the seventh. With humid conditions using too much power was out of the question. Throughout the match Ball seemed to playing a very classic style of play that impressed the Australian. In the other half of the draw Kane Townsend (AUS) saw off a spirited Yoshua Shing. Shing had a chance 10-9 up in the fourth to get the score to 3-2, but two long serves from Shing didn’t quite make the grade Townsend took the match 4-1. 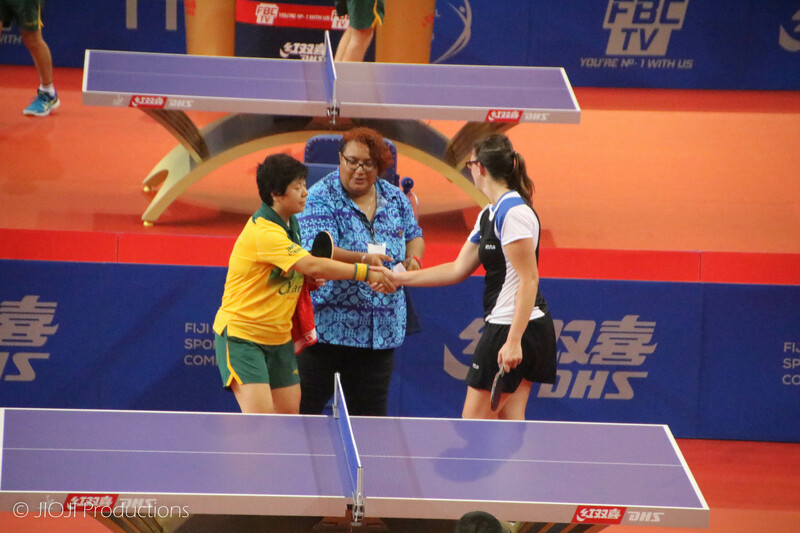 In the Women’s draw Melissa Tapper and Jian Fang Lay cruised in to the final, in what will be a repeat of last year’s semi-final. In Melbourne it was Tapper that came out on top. Danger and Paterson will face off this afternoon for the bronze medal and a noticeably larger cheque.